The 2015 film Battle for Sevastopol is the true story of how Lyudmila Pavlichenko, a female Soviet sniper who killed more than 300 Axis soldiers during World War II, became a gal-pal of the first lady of the United States. That’s a topic so compelling in and of itself that it’s worth putting up with Battle for Sevastopol’s often clunky dialogue and uneven story-telling in order to appreciate its tale of feminism, violence, war-time love triangles and post-traumatic stress. The doomed Soviet struggle to hold onto the besieged Crimean port is not actually the focus of this Russian-Ukrainian film. The original Russian title, Indestructible, is far more appropriate. Pavlichenko was wounded four times in battle and evacuated by submarine from the fall of Sevastopol to rally support for a second front in the United States. It was there that she developed a close friendship with Eleanor Roosevelt — leading the first lady to reciprocate with a Moscow reunion in 1958. In the oddly bourgeois pre-war scenes, actress Yuliya Peresild does a great job of depicting Pavlichenko as a tomboy and an over-achieving straight-A student — a girl who would rather challenge her fellow male students to a competition at the shooting range than flirt with them at the cinema. Despite having never fired a gun before, she proves to be such a natural shot that she is assigned to a special shooting school. When World War II breaks out, Pavlichenko enlists immediately, abandoning an engagement to a kind but awkward young doctor. In reality, she married him and even had a child with him before the war. The film goes on switching back and forth between her career as a sniper in the battles of Odessa and Sevastopol, and her growing friendship with Roosevelt as she struggles with presenting herself to the American media. Unfortunately, Pavlichenko’s romantic life ends up driving the narrative far more than her exploits in the field. Sevastopol depicts her relationships with three men — the pacifist doctor, who serves with her in the Sevastopol battle zone, her combat mentor and finally her spotter and close partner, Leonid Kutsenko. The film implies that she’s more attracted to the violence of the latter two, but despite the tired love-triangle formula trotted out not once but twice, all of them display genuine care for each other — and Pavlichenko is unapologetic in pursuing her own happiness in these relationships. Other problems abound in Battle for Sevastopol. The script’s attempts to clearly sketch out its dilemmas, both political and gender-related, result in awkward, unnatural dialogue, worsened by the lack of native English-speaking actors in the American scenes. The pacing of the two plot threads is uneven and the exposition patchy. There’s no attempt to depict the harshness of the German invasion of Ukraine, which Pavlichenko vividly described in her own speeches and must have motivated her deeply. “Babies murdered, women and girls ravished by the Hitlerite beasts,” she uttered at one point in real life. The inclusion of pop music montages — in one scene, surreally accompanying Nazi headshots — detracts, as well. The film nevertheless directly engages with the issue of Pavlichenko’s womanhood. In one scene, a drill sergeant throws his female trainees’ high heels and stuffed animals in a bonfire. In another, Pavlichenko fights off a sexual assault from a soldier who refuses to take “no” for an answer. Lyudmila’s fiancée repeatedly attempts to dissuade her from entering combat — and later, from returning to it. The American media criticizes her for not being feminine enough. In her first battle, Lyudmila nearly panics under shellfire — until the death of a nearby soldiers spurs her to take a shot. She evolves into a relentless killing machine. As she and her partner gun down Germans celebrating Christmas, a disturbing smile creeps on her face. Sevastopol makes us wonder how Lyudmila became a remorseless “Queen of Death,” but isn’t quite clever enough to offer any explanations. For decades, among the arguments made against including women in combat units, one was on the basis that women lack some kind of killer instinct. 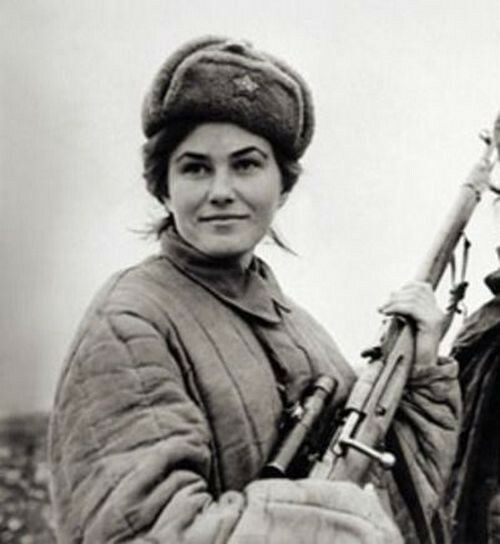 But clearly Pavlichenko, and the thousands of other female snipers that served in World War II, possessed some quality that allowed them to gaze intimately through a scope at heedless soldiers and mete out death. Nonetheless, the war traumatizes Pavlichenko. Despite her surpassing toughness — once, after having her back sprayed with shrapnel from a mortar shell, she carries a mortally wounded comrade all the way to the field hospital — we see how she is scarred, both physically from shrapnel and rifle bullets, and psychologically from shell shock and the loss of loved ones. In one moving scene, Pavlichenko tries to teach Roosevelt how to cook borscht soup and color her cheeks with beet juice, but a clattering pot causes Pavlichenko to suffer an attack of post-traumatic stress. Aside from the romantic subplots, most of the episodes in Sevastopol actually are true to Pavlichenko’s own account, which makes for riveting reading. The film even passes up some extraordinary anecdotes, such as the times German troops tried to entice her to defect, promising over loud speakers her an officer’s rank and gifts of chocolate — no, I didn’t make up that last part. The combat scenes are brief and episodic, but do an excellent job showcasing the lengths snipers went to camouflage their positions and line up perfect shots. It’s just too bad that more time isn’t spent observing the inhuman patience and cunning of the craft — Lyudmila one time reported stalking an opposing German sniper for three days before taking her shot. “Finally, he made one move too many,” she laconically observed. She killed 36 Axis snipers in all. Unfortunately, the camera is usually focused on close shots, and too rarely tries to encompass the wider setting the action takes place in. But when the camera does let us feast on the sweeping Ukrainian steppe or the grey Crimean coast line, the results are magnificent, such as in a scene in which mortar shells rain down on a field of lavender flowers. The stand-out action sequence is a breathtaking air attack on a convoy of Soviet ships evacuating the city of Odessa — portraying the unique naval war on this side of the Eastern Front. The scenes between Pavlichenko and Roosevelt see the former grappling with her identities as both a soldier and a woman. It must surely have helped that Eleanor was hardly a model of gender-conformity. Their friendship eventually gives Lyudmila the confidence to deliver the powerful speeches she made in Chicago advocating for deepened U.S. involvement in the European Theater. Lyudmila’s encounter with Woody Guthrie is also depicted in the film. He went on to release a song, “Miss Pavlichenko” about her exploits. It’s worth noting that Battle for Sevastopol, a joint Russian-Ukrainian production, almost wasn’t released as a result of the conflict over the Crimean peninsula. Pavlichenko was a Ukrainian and served in a Soviet army unit defending southern Ukraine. She’s considered to be a hero in both countries. Although the film doesn’t address the tension between Russia and Ukraine, it is a reminder of a time when the two states fought together against a common foe. Battle for Sevastopol is not a great film, but it concerns a great subject. Although its final message is a bit muddy, it tells us what we need to conclude that Pavlichenko was at varying times and degree a woman, a killer of 300 men, a lover, a rousing speaker and even an intellectual — she went on to become an historian. Social expectations might have confined her into being only the first of those things, but she was too strong-willed to let others decide that for her.